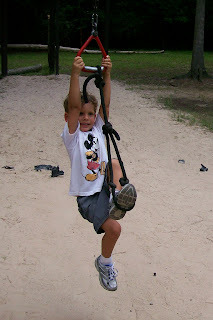 Dawson absolutely loved the zip line at 7 acre wood and he did a great job riding it. 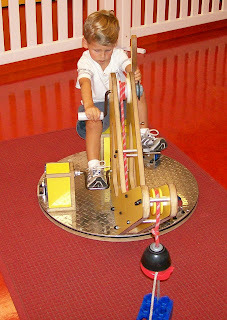 He's a little thrill-seeker! Our MOPS group visiting the 7 Acre Wood in Conroe last week. 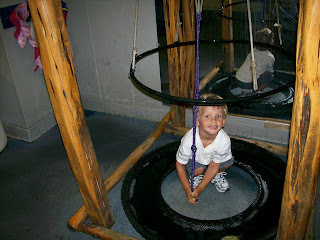 This was our second visit to the 7 acre wood and we had a great time visiting the petting zoo, playing on the playground, exploring the boat, trying out miniature golf, and doing the zip line. 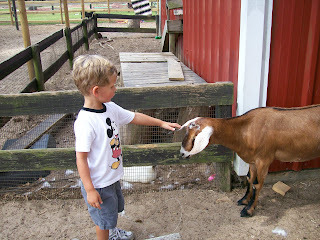 Dawson petting one of the baby goats. They were so tiny and sweet! Petting the baby goat again. He was so gentle. 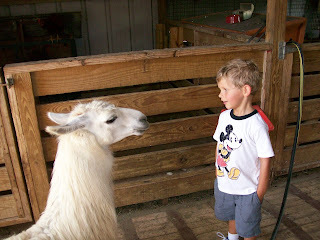 Talking to one of the llamas (there were 3 of them). 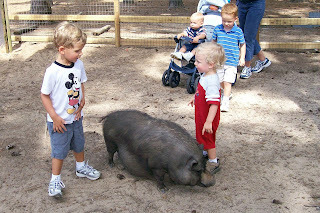 Very amused with the big pig. 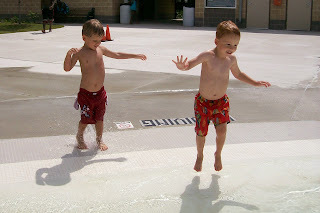 Dawson standing on one of the sprinklers as Carson hops into the beach entry of the pool. 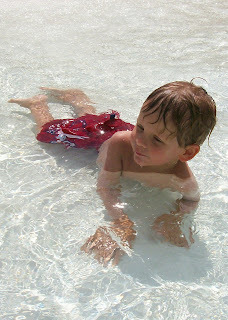 Dawson playing with one of the water canons. 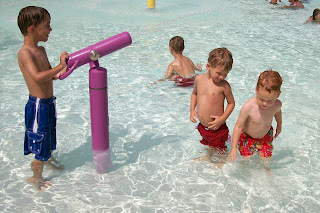 Dawson and Carson being squirted with a water canon. Laying down in the beach area of the pool. Talking to his friend Eli. One day we were all outside throwing some balls around and Randy happened to grab the ball that Dawson wanted. 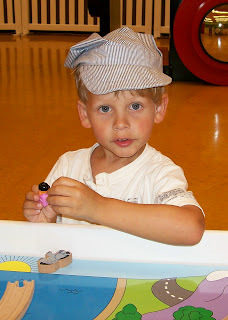 Dawson looked at him and said very seriously, "I'm very disappointed that you didn't cooperate, Dad." LOL!!! Whenever he has to rush off to the bathroom or to bath or something and one of his games or snack is still out he'll tell us, "Don't eat my snack, Mom." or "Don't put my puzzle together, Dad." He wants to make sure everything is just as he left it. 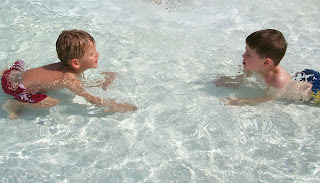 When he accomplishes something like completing a puzzle on his own or going underwater at the pool, he'll ask me, "Are you so proud of me, Mom?" Dawson and I were waiting for the elevator at our hotel and he said, "What's going on here? This is taking forever!" 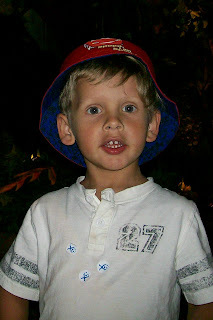 Dawson looking very cute in his new Cars bucket hat. 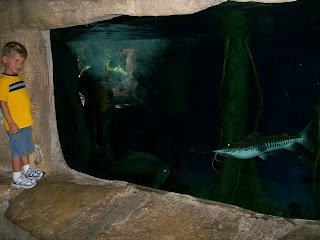 Dawson watching the fish in one of the big fish aquariums. He was very amused with this catfish, which would follow him from one end of the window to the other over and over again. 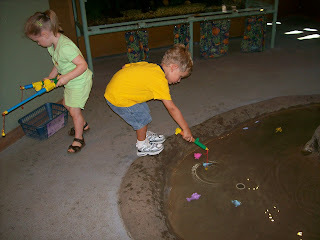 Enjoying the kid's fishing pond where they can catch fish with magnetic fishing poles. 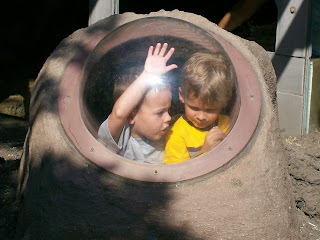 Chance and Dawson getting an up-close view of the prairie dogs. 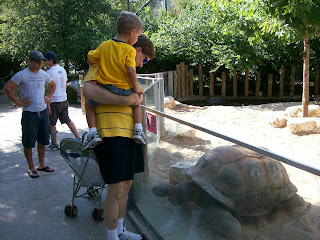 We were all very excited to see these huge tortoises crawling around. 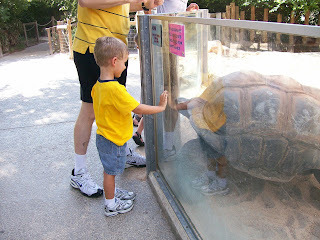 Dawson talking to the tortoise. 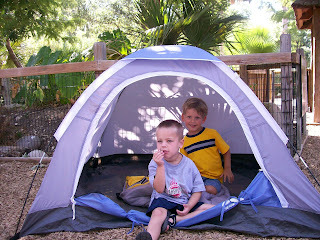 Chance and Dawson in the tent pretending to camp out. 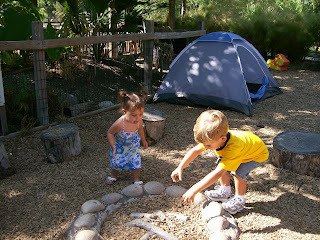 Caselyn and Dawson throwing wood chips into their pretend fire. 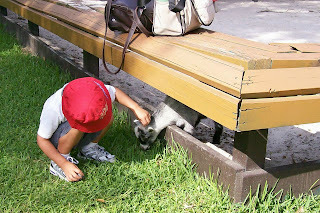 Petting the goats at the petting zoo. 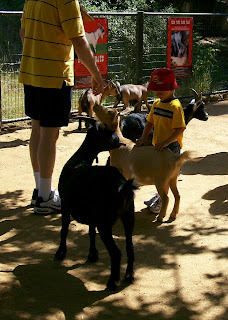 While he was in the petting zoo the goats started chasing him in an attempt to get some food. 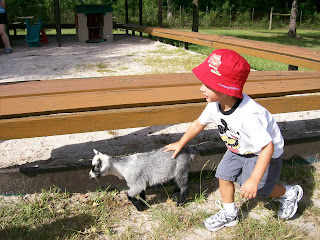 Dawson thought this was the greatest game and kept trying to get the goats to continue chasing him all over the pen. 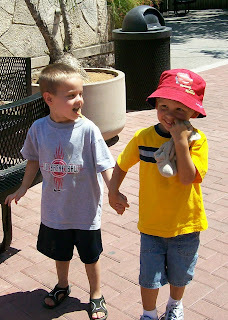 Chance and Dawson hand-in-hand as we leave the zoo. 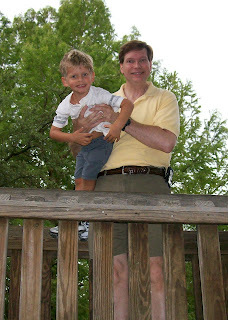 Randy and Dawson having fun at the park in San Antonio. 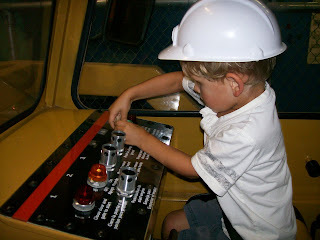 Dawson in the driver's seat, preparing to operate the front end loader at the children's museum. 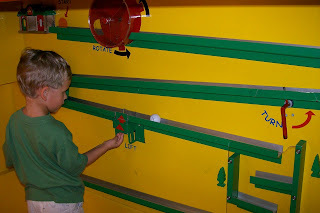 Pushing the buttons to move the machine forward, dump the rocks into the bin, and then move it backward to return to the gate. 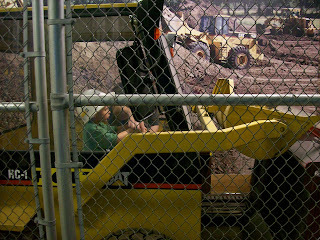 Dawson and Randy in the front end loader. 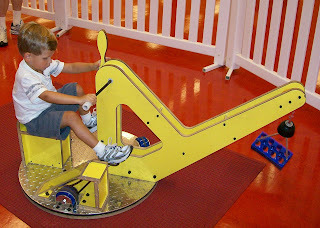 This was a great attraction at the children's museum. 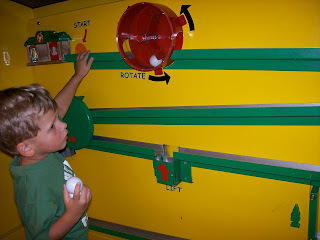 Dawson repeatedly put the golf balls on the course and helped them along the path by turning knobs and pushing levers. 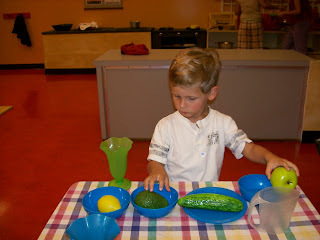 Dawson preparing a tasty snack at the children's museum kitchen. 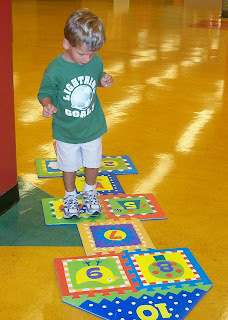 Hopping on the hopscotch mat at the museum. 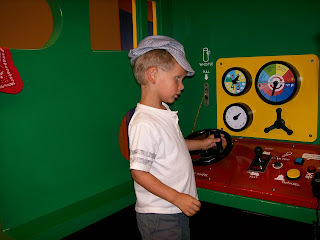 The crane was a really neat feature of the children's museum. 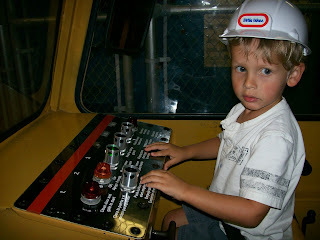 The foot pedals turned the crane and the hand pedals lifted and dropped the hook. 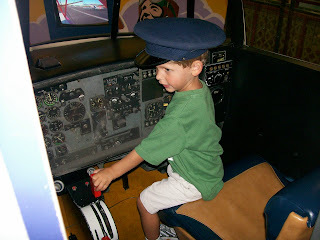 Co-pilot Dawson helping to fly the airplane. 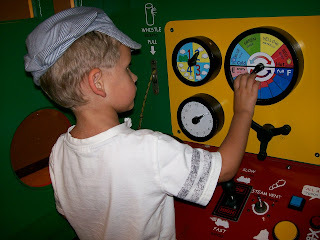 Playing with the many gears in the plane. Saying a quick "cheese" for me before he returns to the task of flying. 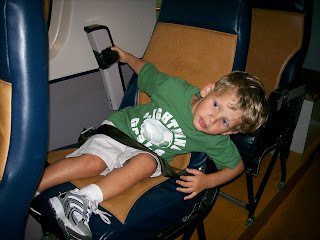 Riding in one of the passenger seats. 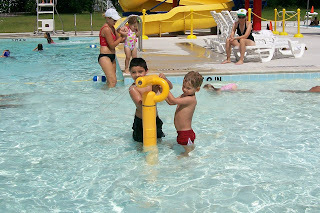 Randy and Dawson releasing the boats into the current to see which one will finish first. Dawson watching his boat flow through the chutes. 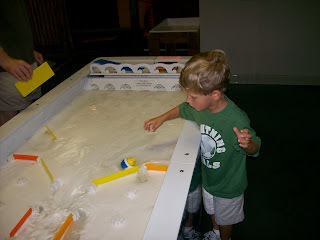 For some reason the water table had bubble juice in it, creating lots of suds. 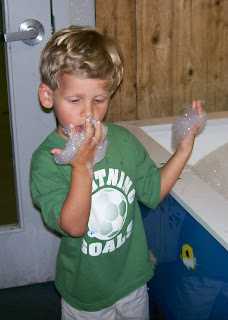 Dawson had fun putting his hands into the suds and then blowing the soap bubbles off his hands. 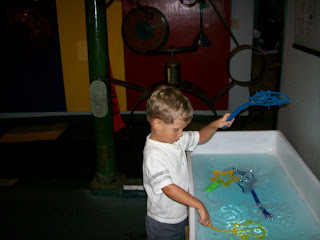 Blowing bubbles with the various bubble wands in the museum's bubble room. 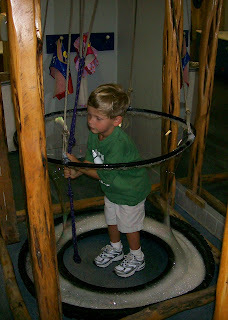 Lifting the ring to make a giant bubble. The giant bubble surrounding him. 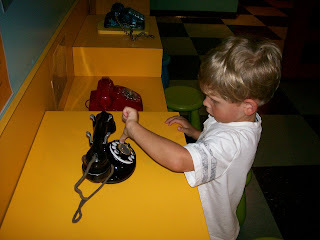 Dawson dialing an old rotary phone at the children's museum. Listening to the story on the phone. 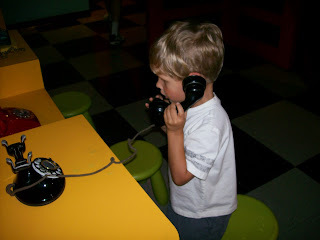 When you pick up any of the phones, you can hear a children's story. 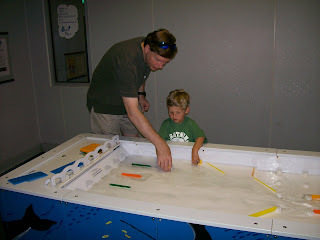 While we were in San Antonio, we visited the children's museum twice. 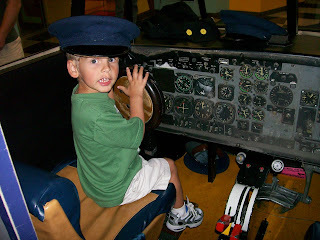 We have a family membership to The Woodlands Children's Musuem, which allows us free admission to the San Antonio Children's Museum (among many others) - what a deal! 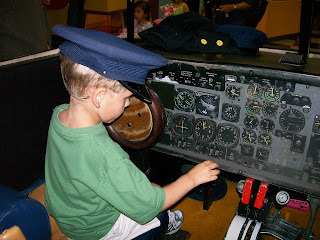 It's a great 3 level museum with many wonderful exhibits, including a big trolley car and an airplane!!! 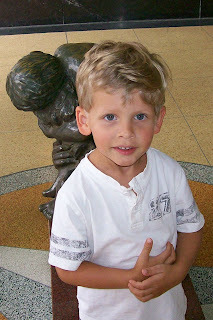 Dawson looking cute as he waits outside the children's museum. 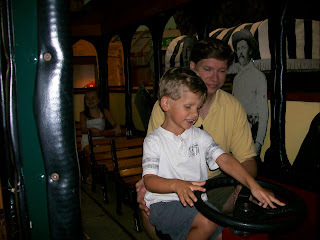 Dawson and Randy driving the trolley bus. 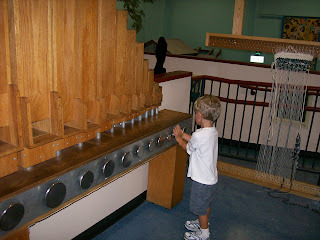 Pushing the buttons to make music. 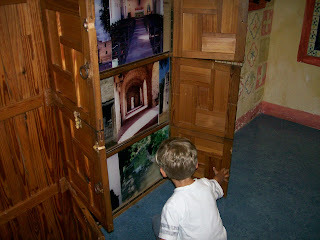 Opening the doors and looking at all the beautiful pictures. 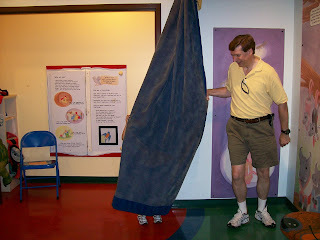 Dawson hiding behind the curtain. Pretending to sleep in the bed at the playhouse in the museum.